The 90-minute propaganda stunt, “2016: Obama’s America,” banks on the assumption that audiences are idiots. How else to explain its crackpot corroboration of unsubstantiated gobbledygook masquerading as an incendiary examination of the 44th U.S. president? The film isn’t really about Barack Obama at all. It’s about author/co-director/narrator/star Dinesh D’Souza and his own warped view of America, which seems to exist entirely within an alternate reality completely detached from our own. Perhaps the man has a future in science fiction. In D’Souza’s America, racism is a thing of the past, an argument that he proudly expressed during a debate with Jesse Jackson. Since “2016: Obama’s America” is built entirely on white America’s fear of “the other”—fear of Muslims, fear of anti-colonialists, fear of “card-carrying Communists,” fear of presidents with the middle name Hussein—D’Souza’s sentiments make him palatable to even the most extreme closet racist, despite being a “man of color” himself. With his laughably self-important professorial shtick, D’Souza has the posturing of a scholar but not the intellect. Since the majority of his film is devoted to a preposterously doom-laden interpretation of Obama’s 1995 memoir, “Dreams from My Father,” D’Souza skims so quickly over his own criticisms regarding Obama’s presidency that he leaves little time for the audience to absorb them. Maybe this was a conscious decision on the part of co-director John Sullivan (who helmed the equally inane Ben Stein doc, “Expelled: No Intelligence Allowed”), since there isn’t an ounce of truth in any of his claims. To support his argument that Obama inherited the anti-colonial beliefs of his father, D’Souza points out that the president removed a bust of Winston Churchill, the poster boy of British colonialism, from the Oval Office. He fails to mention that the bust was scheduled for removal before Obama even took office or that another bust of Churchill indeed remains in the White House. D’Souza’s claims about Obama’s policies regarding Iran’s nuclear program and the Falkland Islands are transparently false and are immediately destroyed by the slightest bit of research, which the author clearly expects his target audience to avoid. 2016: Obama’s America was released on DVD on October 16, 2012. D’Souza conveniently forgets to mention the 2008 financial crisis or the assassination of Osama bin Laden while portraying Obama as a careless spender and jihadist sympathizer. One of the funniest aspects of the film is how every member on D’Souza’s panel of extreme right wing experts are credited as “Dr.” Even the pull-quote on the back of the film’s DVD case is credited to a doctor, namely Dr. Ted Baehr of Movieguide.org, whose organization’s stated mission is to “redeem the values of the mass media according to biblical principles.” It’s little wonder that the good doctor has pointed his holier-than-thou thumb toward the heavens for D’Souza’s film, since it was distributed by Rocky Mountain Pictures, which specializes in bargain basement dreck targeting conservative Christians (such as “End of the Spear” and “Atlas Shrugged: Part I”). From its hideously pedestrian score and hokey editing to its hilariously staged sequences of dour scholars barking prophecies over the phone while being slickly photographed from every angle, “2016: Obama’s America” is the very definition of amateur hour. It makes Michael Moore look like Errol Morris and the Republican party look like a league of gullible lobotomized slackjaws. There are a thousand credible ways that a filmmaker could go about criticizing President Obama’s first term in office, but D’Souza isn’t interested in facts. He’s not a scholar but a delusional, Ann Coulter-type conspiracy theorist appealing to the most fanatical sect of right-wingers, a group that the Republican Party has apparently decided to court as its base. Liberals are bound to laugh derisively at every frame of this picture. It’s conservatives who should really feel offended. ‘2016 Obama’s America’ is released by Lionsgate Entertainment and stars Dinesh D’Souza. It was written and directed by Dinesh D’Souza and John Sullivan. It was released on October 16, 2012. It is rated PG. Submitted by GCoop (not verified) on October 30, 2012 - 12:57pm. You talk about the the assumption of the audience being idiots. Isn’t this what the mainstream media does everyday… Come on guy think before you write. •Obama incessantly spikes the “I got bin Laden” ball at the Democrat convention. •A number two Al Qaeda operative gets nailed by a drone. •Al Qaeda decides to teach Obama and America a lesson, and plans a terrorist attack to coincide with the 11th anniversary of the Islamic attack on America. •Monday evening, 9/11/12, Ansar Al Sharia attacks our consulate in Benghazi. Some say they are trying to kill our Ambassador, Chris Stevens, others say they were trying to capture him so that they could then negotiate a trade for the Blind Sheik. •The White House is notified of the attack within two hours. There are reports that the entire attack was being watched live in the White House situation room. •Obama says that he ordered the Defense Department and the CIA to do everything possible to save the lives of our people in that consulate. We don’t find out about this alleged order until three weeks after the attack. Personally, I don’t believe the order was ever given. •If the order was actually given Defense Secretary Leon Panetta ignored it when he ordered American troops to “stand down.” Americans were dying on the ground, but Panetta didn’t have enough information to send in the troops. •Two Navy Seals apparently disobeyed orders ( but probably obeyed a ‘higher’ order) and went to the rescue of the Americans in the consulate. They both died. While there they were “painting” a mortar position (being used by Islamists to attack the consulate) with a laser, and calling for that position to be taken out. Our military didn’t act. •Obama had outsourced the security for the consulate to a group called The 17th of February Martyr’s Brigade, an offshoot of Ansar Al Sharia, the very group that was attacking the consulate. •There were drones circling over the attack as it was going on. We can’t learn whether or not these drones were armed. •There were AC130U gunships available that could have been on the scene in under an hour. They were not used. •The morning after the attack, and a good night’s sleep, Obama speaks to the press and blames the attack on the video. He claims that he referred to the attack as a terrorist attack at that time. The transcript shows that he did not. •As soon as Obama makes his statement to the media blaming the attack on the video he heads to the second floor of the White House to pack for his trip to Las Vegas for a fund raiser. •For the next two weeks the Obama junta relentlessly pushes the idea that this attack was a spontaneous attack because of an amateur video about Islam. He continues with this line even while the interim president of Libya is telling the world that it was planned by an offshoot of Al Qaeda .. nothing spontaneous about it. •Obama sends his UN Ambassador Susan Rice out to push this completely made-up “video” scenario, knowing it was false. •Obama even goes before the General Assembly of the United Nations and shares his “it was the video” story with the world. At that time he absolutely knew it was a planned attack from Ansar Al Sharia. •In the meantime the dominant elements of the ObamaMedia are dutifully conveying the “it was the video” line so as not to harm the reelection chances of the president they promoted with no vetting in 2008. Submitted by Jun (not verified) on November 1, 2012 - 12:41pm. Wow! If true this is complete negligence by our Commander-In-Chief (CIC) and the subsequent coverup dwarf Watergate. In that regard, how could anyone in their right mind still vote for our present CIC?? Submitted by Terry (not verified) on November 1, 2012 - 10:39am. 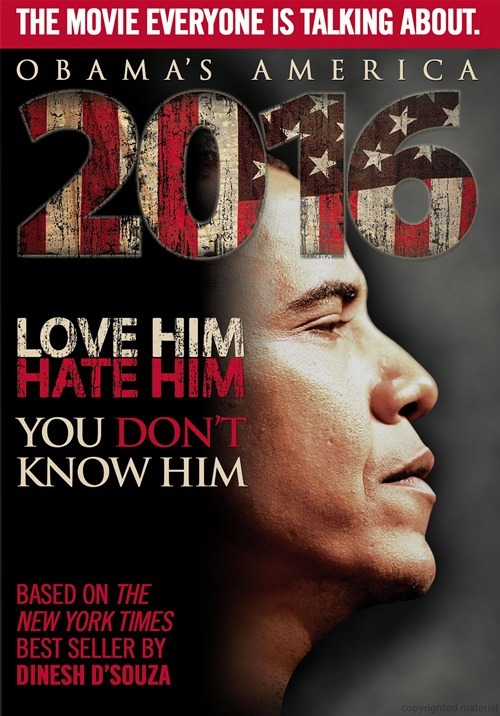 If only 10% of this documentary is true, then Obama is not fit for the Presidency. Submitted by Anonymous2012 (not verified) on November 1, 2012 - 11:42am. Submitted by another research observer (not verified) on November 1, 2012 - 2:14pm. It is unfortunate that anyone would take Matt Fagerholm seriously without any facts. His statement about Dinesh telling Jessie jackson there is no racism is a lie that is explained in the movie to those like Matt that want to misquote Dinesh just for the sake of supporting a view that they believ in without any facts. Comedy? The only one laughing is Matt Fagerholm at you for believing in his comments. He knows your symapathy to his comments will keep you from checking it out. That is what is sad. Submitted by Piedad (not verified) on November 1, 2012 - 12:06pm. Submitted by Anonymous29 (not verified) on March 23, 2013 - 5:30am. in this documentary more people love Obama.